The Mind Of The Monster! 48-page giant. "The Mind of the Monster!" Guest-starring the Fantastic Four, the Hulk, and Thundra. Story by Gerry Conway. Art by Rick Buckler and Joe Sinnott. Bruce Banner visits the Baxter Building and devises a plan to turn the Thing back in Ben Grimm and also rid himself of the Hulk forever. But something goes wrong...and a brand new Hulk vs. Thing battle erupts! Fantastic Four members: Mr. Fantastic, Human Torch, Medusa, and the Thing. This issue includes a 4-page write-up from Roy Thomas describing the format and next story planned for the Giant-Size series. 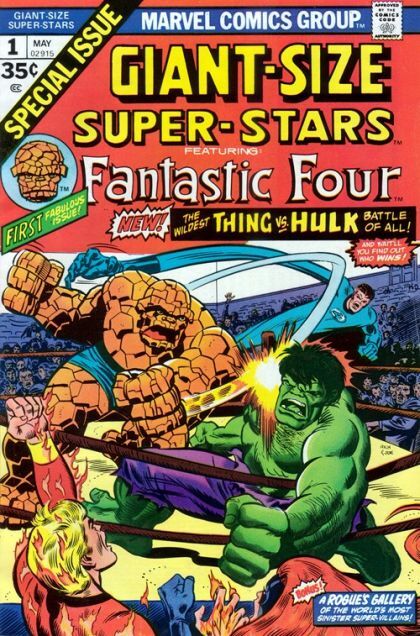 This issue also contains a 7-page rogues' gallery of famous FF foes. (Note: The title of the series changes to Giant-Size Fantastic Four for the next issue.) Cover price $0.35.